Traveling to Mazatlan and gluten averse? Generally speaking Mexican food is heavily corn based. However, because Mazatlan’s cuisine has strong French influences, it’s always best to ask the waiter if the dish is made with harina (white flour) or maseca (corn flour) when dining out. To simplify your choices, we’ve put together a list of items that are generally gluten-free (but as always, double check before ordering!). Always aim for corn-based meals, such as chilaquiles, a tortilla chip dish generally served for breakfast with eggs, or opt for meats like lengua (cow tongue) and machaco (dried shredded beef). Standards such as huevos rancheros are also served with corn tortillas. Lunch tends to get a bit more complex (hello, burritos!). Burritos are made with white flour and are NOT gluten free. In fact, burritos hail from America and are more Tex-Mex than Mexican. Tortas are often confused with the word tostada. Tortas are sandwiches made with bread, while tostadas are fried corn tortillas with delicious toppings. Because the names can appear similar, make sure you know which you are ordering. Quesadillas are also another item that are generally flour based outside of Mexico. Depending on the restaurant and the amount of tourists that frequent the establishment, quesadillas could be made with flour or corn tortillas. It’s always safer to ask prior to ordering. Now for dinner – what should I get? Tacos, tacos, tacos. Some of the best meals you’ll ever have are from street vendors or restaurants serving tacos. Made with corn, you can never go wrong with ordering a bunch of tacos and filling them up with pico de gallo and fresh pureed salsas to round out the evening. Gluten-free desserts are more difficult to find, since most cookies and pastries are made with flour in Mexico. Flan is probably the most iconic Mexican sweet to order, and you can’t go wrong with the Mexican version of the French crème brulee or Italian panna cota. Did you know the word “tequila” is reserved exclusively for the distilled spirit produced in the state of Jalisco, Mexico? Like champagne, cognac and other spirits, tequila has an appellation of origin. 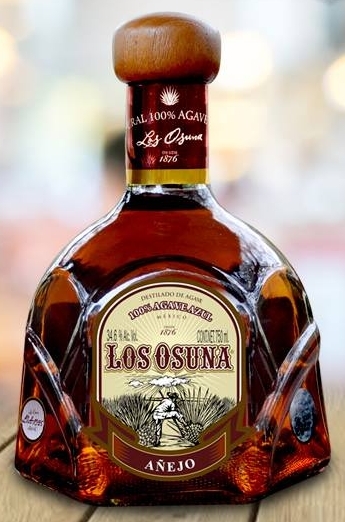 In honor of the U.S. National Tequila Day on July 24, we wanted to give a shout out to our friends Los Osuna Blue Agave for producing some of the best (not technically tequila) Blue Agave. All five of the Los Osuna Blue Agave products go through the same initial process to get their desired outcomes. Each of the agave plants are cultivated for 7-8 years until their spines are removed and the piñas are transported to the distillery. Once at the distillery, they go through a four-step process, beginning with steam cooking the piñas in traditional underground ovens. This process helps transform the starch into fermentable sugars and soften the piñas to help ease the extraction of their juice, which is done by milling and mashing them, often using traditional methods. Next, the sugar goes through its fermentation process to transform it into alcohol. Distillation officially completes the process, and the final product is obtained from the fermented musts. The two-step distillation process allows the rough product to consist of 60 degrees of alcohol per volume. Once the product is obtained at 60 degrees of alcohol, the next steps are taken to determine the type of Blue Agave it will become. In order to successfully create a blanco bottle, the bottling process lowers the degree of alcohol to about 35 degrees by adding distilled water, creating the Blue Agave Blanco. These are typically not aged at all with the higher concentrate of distilled water to discern it from the rest of the products. The bottle is about 80 proof. Characteristic flavorings include citrus, licorice and pepper accents. To achieve the reposado, the white product is introduced in oak barrels for a period of 3-11 months, giving it an oaky aroma and flavors. The bottle is about 80 proof. Characteristic flavorings include floral, vanilla and almond accents. For the añejo, the white product remains in white oak barrels for at least one year. The bottle is 80 proof. Characteristic flavorings include vanilla, oak, caramel and a hint of tobacco accents. This product goes through a very similar process as the reposado, and it is generally aged up to 11 months. With the addition of vanilla flavoring and additional sugar, the proof is brought down to 40. Exactly the same as the Vanilla process, except with the addition of the cinnamon flavoring. Again, the added sugar brings the alcohol to 40 proof. Sign up for our newsletter to get more tips on exploring Mazatlan. If you find yourself making a trip to Mazatlan, the place to be is in the Centro Historico neighborhood. This is where you can eat your heart out at some of the best restaurants our city offers. La Nueva Cocina Mazatleca is the latest culinary experience, serving up delicious plate after plate of pure flavor. Food is life down in Mazatlan with offerings of everything from seafood to gourmet dining. Here are a few of our local favorites. Casa Garcia is tucked away inside a partially restored colonial house, and was formally owned by the chef’s grandmother. Come here for the ambiance and the ribeye and two glasses of wine with candlelight setting the scene. Make sure to book reservations as this is a popular place for celebrations and parties. This restored colonial home houses countless plates featuring faces of prominent Mazatlecos. Beautiful well-known lyrics from singer-songwriter Fernando Valades animate the walls and romance visitors. Opt for the balcony so you can view the happenings of Plaza Machado from above. A very popular spot for Americans visiting from out of town, this Minnesota-owned establishment has been a staple of Centro Historico for years. With an extensive wine collection, the ambiance is very relaxed and the complimentary guacamole appetizer always hits the spot. Located in an old cistern, this place is only open from 5-10 p.m. and closes for most of summer. That makes visiting a must during peak season in Mazatlan to experience dining in a semi dark, semi-exotic restaurant with strange paintings and artwork. If you aren’t sure that you can make small talk, this is the place to go as the art will give you plenty of things to talk about! Located right next to the beach, this location is our favorite spot for breakfast or brunch. Sitting al fresco with an exquisite view of the Pacific Ocean is our preferred method. Some noteworthy favorites are: Huevos Rancheros, Lengua, Machaca con Huevos and the Chilaquiles. Go for a bike ride right after if you get too stuffed! Summertime is the time for heat waves and hot summer nights if you’re north of the equator of course. Mazatlan has some of the best seafood restaurants but none other than Lucila’s Restaurant has been graced with Chef Patricia Quintana’s expertise. When Edvin Jonsson was 23 years old he decided that he wanted to correct a wrong, there’s simply no good beer in Mazatlan, so he needed to make his own. Six years later, and a healthy obsession of brewing beer at home, turned into his very own microbrewery in Mazatlan well on its way to becoming the place to get the best I.P.A. in town after only being open for one year. We sat down with Edvin to pick his brain a bit on beer and his process. 10 most delicious, savory, delectable, scrumptious, spicy, sweet, tangy and heavenly candies from Mexico. Mazatlan is home to some of the best shrimp and seafood restaurants, while also having some of the best Blue Agave and mango liquors. But did you know restaurants in town are filling up with tons of vino? Here's our list to some of the best spots for some wine drinking in this coastal city to take a loved one on a romantic date to. The world of gastronomy has long been a predominantly male-dominated industry, especially when it comes to Top Chefs. Very few women have broken boundaries and thrived in the field, especially women from Mexico. However, Patricia Quintana has done just that and much more in the 45+ years she’s reigned the cooking world. She has ruled gastronomy – specifically when it comes to Mexican cuisine – with her cookbooks, countless recipes, her own Gavilla brand, and her knack for discovering the history of pre-Spanish colonized Mexican dishes by visiting indigenous villages throughout the various regions of Mexico. A legend in her own right, Patricia wasn’t always the “Queen of Mexican Cooking,” but had to break down barriers to get where she is today. Is it possible to be in three places at the same time? Not for most people, but Marino Maganda Pacheco seems to have a knack for accomplishing many things at once. Not only is he executive chef for Pueblo Bonito Resorts – five of which are located in Cabo San Lucas, and two in Mazatlan – but he’s also curator and executive chef at Casa 46, a popular dining spot in Mazatlan; the lead organizer of the Culinary Roots Festival, an annual gastronomy event focused on promoting Sinaloan cuisine, which had its first convention last year in Mazatlan; and a family man with two kids. Even so, as winner of the Creative Chef of Mexico in 2007 and first place winner of the 2010 Cook of the Year in Mexico, Marino shows no signs of slowing down, even as he joins us for a conversation. We believe this statement to be true: Brunch is best served on the weekends. However, we also believe it can be enjoyed Any Day Of The Week. We love Brunch in Mazatlan that much. Here are some of our favorite spots to enjoy an amazing meal in Mazatlan. These spots get our top vote and know how to do it right, every time. The latest cocktail to hit the bars and clubs has been the Jalapeño Margarita, so we decided to put our resident bartender Arturo up to the challenge of creating the mix. The Jalapeno Margarita is the perfect drink all year round but it is especially delightful during the winter months with the added spice to the classic margarita. Stop by from 5-7pm for our Happy Hour every Monday through Friday or try out this cocktail at home. To make the Jalapeño Infused Simple Syrup, warm up a pan and combine the water, sugar and jalapeño and bring to a simmer for a couple minutes. Add the contents into a blender and puree the ingredients. Keep refrigerated until cool. Mix together the classic margarita ingredients in a cocktail shaker filled with ice once jalapeño infused simple syrup has cooled down. Taste before adding more jalapeno simple syrup to the shaker. Use a lemon wedge to rim the glass and then place the glass face down onto salt. Pour the mix in the glass with ice and garnish with lime and jalapeño wedges. Machaca is one of Mexico's most popular items and Lucila's Restaurant makes some of the best machaca dishes in all of Mazatlan. What is Machaca? Machaca is dry shredded beef that has been rehydrated. The process to make authentic machaca is long and arduous. To save time and effort, you can buy ready-made machaca from a local Mexican grocery store. If that is not an option, slow cooked roast beef brisket or shredded + then fried skirt steak can be used as a substitution.